Should You Never Give Up on Your Dreams? So… which approach is more true? Should we never give up? Or, is there a time we should give up? How do we decide when to give up? How do we distinguish between feeling overwhelmed right now versus deciding it’s time to quit? If you’ve been following us for a while you know that we rarely talk about “giving up.” Yet when we’ve been working towards a goal for a long time, and not seeing the results we’re hoping for, it’s only natural to consider throwing the towel in. Thoughts of doubt creep in. But you can never be certain if calling it quits is the right option. It probably doesn’t help to read quotes like “Never give up!” when you’re battling the storm of indecision about it. There are also the external opinions of people who think you should quit vs people who believe in you and your dreams. Which voice is the right one? Is there a right voice at all? 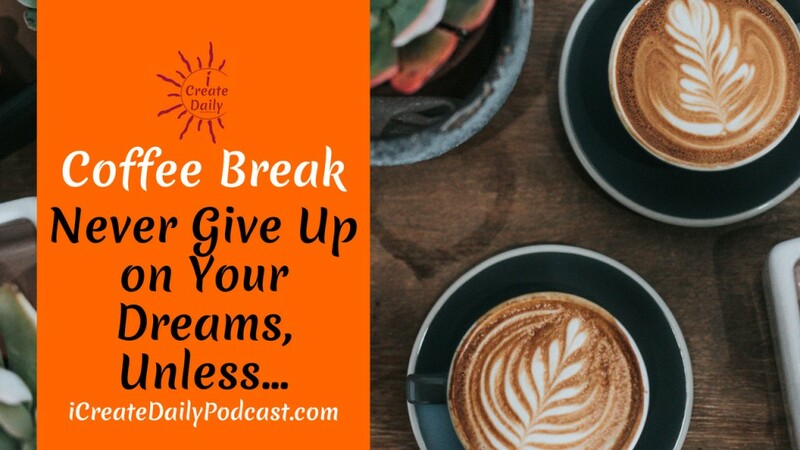 We cover all those questions in this Coffee Break as well as our own stories and examples the pros and cons of giving up. How to decide when to keep on going and when to give up? Only you can decide for you, but how? Do You Like Longer Coffee Break Episodes? Would you rather us make longer episodes into multiple parts? Do you enjoy the occasional longer ones? Please send an email to Creators@iCreateDaily.com or message our Facebook Page. Several listeners have mentioned they really enjoy the Coffee Break episodes and we want to make ensure the content is valuable. Your feedback is always welcome as we evolve and grow! Looping back to Churchill, if you like historical dramas, Darkest Hour is an incredibly well-done movie. It portrays Churchill’s perseverance in the face of tremendous opposition and near failure. And it wonderfully humanized a man who’s become a legend.